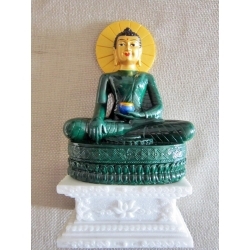 Jade Buddha for Universal Peace statues made from resin and hand painted. Each statue is signed by Ian Green. What is the Jade Buddha for Universal Peace? Reclining Ganesh - Silvertone metal 6"
The gentle, wise, elephant-headed Ganesh, or Ganesha, is one of Hinduisms most popular deities. 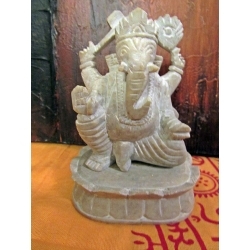 Ganesh is the remover of obstacles, the deity whom worshippers first acknowledge when they visit a temple. Ganesh is also patron of letters and of learning; Ganesh is the legendary scribe who, using his broken tusk, which he often holds, wrote down parts of the Mahabharata epic.